In the late forties and the early fifties the well-known British arabist Terence Frederick Mitchell (1919–2007) did fieldwork in the Berber speaking town of Zuara on the west coast of Libya. In Zuara, he had the good fortune to meet a young man called Remdân Azzâbi who was to become his major informant for the Zuaran Berber language. For him Mitchell arranged a two years’ stay in London, which allowed them to work together on the analysis of this language of which so little was known. The fruitful cooperation with Remdân Azzâbi enabled Mitchell to publish three fundamental articles on Zuaran Berber. However, the bulk of Mitchell’s research results remained unpublished. This is also the case for Ferhat, an everyday story of Berber folk in and around Zuara, which depicts the daily life of a Zuaran family, in particular of Sa’id and Za’ima, and the upbringing of their son Ferhat. 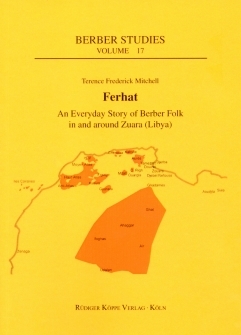 Half a year before his death in January 2007, Mitchell had handed over all his material on Zuaran Berber to the editor of the Berber Studies series with the permission to publish it. Of all Mitchell’s documents the Ferhat book was clearly the closest to publication. One major decision had to be made in relation to this book: either to publish it unchanged, i.e. in a version printed on an old dot printer, or to publish a more readable edition after digital manipulation of the text. The series editor decided to publish the book unchanged, and thus made available the original version of the longest corpus of Zuaran Berber texts for berberologists and others interested. The present volume contains a transcription of the original text and an English translation as well as a bibliography of previous linguistic work on Zuaran Berber. The autograph edition is completed by an appendix on marriage customs in Zuara. In the meantime, further manuscripts of Mitchell have been published in this series, as well as further monographs on Libyan Berber languages, see the link below. This story differs from most other published Berber texts in that it is not a collection of traditional oral literature like “Märchen” or proverbs. It is the form of the narration which makes it an even more special and valuable publication. Through this life story we get an enormous amount of information and insight in the daily life and culture of a Libyan Berber family in the first half of the twentieth century. [...] In general this is a very valuable contribution in Berber studies. This publication has made it possible to study this little known Berber dialect from an area which is, for several reasons, underrepresented in Berber studies. All in all, it is a text, worth reading for anybody interested in Berber and Libyan culture, language and linguistics.